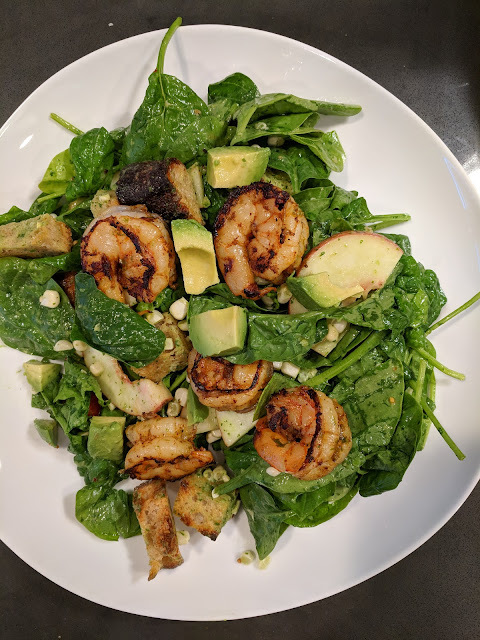 Made this awesome salad the other night, which we ate while watching Terrace House (version Boys and Girls in the City) amongst all our boxes that still need to be unpacked. But we are 90% done, which is pretty good. Summer weather makes me want to minimize the amount of time spent in the kitchen. Preheat oven to 350degrees F (or toaster oven, since this is just for croutons). Mix bread, oil, salt and pepper together. Bake croutons for 15-20 min, until crispy. We happened to have focaccia from Bub & Grandma's (one of the best breads around) so we used that - it was amazing. Combine shrimp with smoked paprika, chili powder, lemon/lime zests, olive oil, salt and pepper. Set aside to marinade while making the rest of the salad. Blend all ingredients for dressing in a food processor or blender. Adjust for seasoning. Since my avocado was small, I threw in another 1/2 avocado. The dressing should be thick but not too thick. Think the consistency of bleu cheese dressing (the kind from the bottle). Grill shrimp, either outdoors or on an indoor grill pan - about 2 min on the first side and 90 seconds on the second side. Be careful not to overcook. Toss together with vegetables and croutons, then put in about 1/2 cup dressing. Toss thoroughly before adding more dressing - you want the greens flavored but not soggy. Eat and beat the heat!